The Arabic sign is بيع الدواجن المذبوحة for which the correct translation is "Sale [of] Slaughtered Chicken", meaning that they are not sold alive, already killed according to Islamic law. 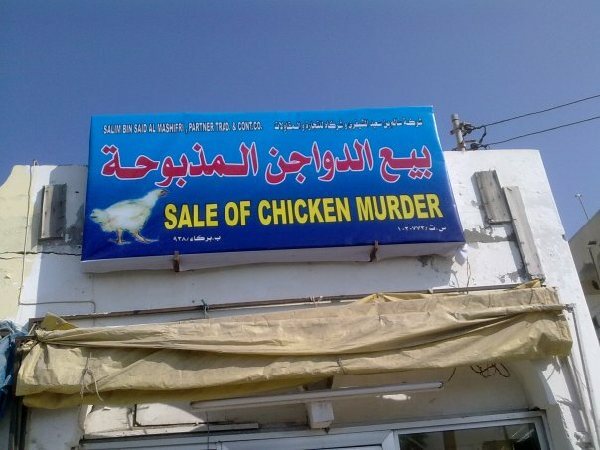 The creative translator of the sign decided to use "Sale of Chicken Murder", not knowing how to express that they are already slaughtered. Optimism — the expectation of a better tomorrow — is universal, according to a new worldwide Gallup poll. Around the world, 95 percent of people expect their lives in five years to be as good as or better than they were five years ago. Notable by the pessimism of its people is Egypt. Joining Egypt are Bulgaria, Haiti and Zimbabwe. Zimbabwe and Haiti are understandable, the former having witnessed severe economic and political strife recently. The latter is the poorest nation in the Western hemisphere. Due to the inflation and soaring cost of living in recent months, there is general discontent in Egypt by the majority of people there. Although this is nothing unusual in itself, given the stagnant economy for close to three decades, it seems that it has reached a point where most people have had enough and want to send a message to the government. An American exchange student from Maine stayed with Coptic Christian family in Alexandria, Egypt. He weighed 155 pounds upon arrival, and returned only at 97 pounds. He claims that he was not given enough portions to eat, and that the Christian Coptic mandate to fast 200 days a year (with no animal protein) made it happen. His Egyptian host family denies the allegations. Shaker Hanna says that it is "a lie", with the boy's parents planning to recover some of the costs of his stay.